Where's Bob's Hat? is the best with 3 or 4. Over several hands, players bid to take the most cards in one or more of the three suits, each a different kind of hat. Players who feel they will take few, if any, tricks may bid to take the fewest cards in tricks played during each hand. Players score points for making their bids and lose points for missing their bids. Several cards picture Bob's Hat in addition to the hat of their suit. 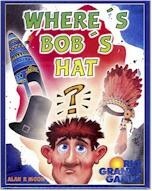 When a player wins a trick containing a card with Bob's Hat on it, the player takes the Bob's Hat card(worth plus or Minus 10 points). The player with the card at the end of the had adds (or subtracts) 10 points to his score. The player with the most points at the end of the game is the winner!